After being in the business of raising wool sheep of various kinds for two decades, I decided in 2005 to start with hair sheep. It was a fairly bold move at the time since it meant giving up on the customers who bought breeding stock from me, and since I also didn’t know how well my market lambs would sell. I had heard all the negatives about them such as “The lambs get too fat”, “The lambs sell for less money at auctions”, “The pasture will be littered with wool as these sheep shed”, and “They get too cold in the winter”. 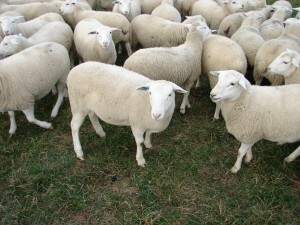 I had a Texel flock of 100 breeding ewes at the time when I bought my first White Dorper rams. My Texel sheep had served me well with their ability to finish on pasture, with their excellent meaty carcasses and with their lambing percentage of over 200 percent. However, Texel sheep breed strongly seasonal, are heat sensitive, have at times problems lambing due to the broad head and shoulders, and they need shearing. I shear myself and since I wanted to increase the size of my flock I was not looking forward to shearing even more sheep. Dorper sheep originated in South Africa and were the result of crossing Dorset Horn with Blackheaded Persian sheep. Two varieties of Dorper Sheep were created: the black headed Dorper and an all white variety, the White Dorper sheep. Although the breed was created in the 1930s, it is still fairly new to the US. To avoid the coloring and spots that come along with first and second generation cross breeding with Dorper sheep, I decided to go with White Dorper sheep (WD). Later on I found out that this was the faster route to accomplish shedding in the offspring. I used purebred as opposed to full blood White Dorper rams to upgrade my flock. They were significantly more reasonably priced and for practical matters were the same. Today I have 1/2, 3/4, 7/8th, and 15/16th White Dorper sheep. The percentage of 15/16 is considered purebred. 7/8th exhibit all the traits of purebreds like out-of-season breeding and even many 3/4 look like purebred and shed as well. I raise all my sheep and lambs strictly on pasture and feed no grain whatsoever. The ability of this breed to put grass into weight gain is remarkable. But what about the market lambs getting too fat? While I had no worries about my 1/2 market lambs since the Texel influence was still strong, my anticipation when the first 3/4 market lambs were harvested was great. I usually harvest my lambs between 80 and 90 lbs. while letting some lambs reach weights up to 100+ lbs. At that weight there are no problems with too much fat cover whatsoever. That applies to purebred WD market lambs as well. I had on occasion lambs butchered that exceeded 110 pounds. At that weight the fat cover did indeed get too much. It is also well established that heavy grain feeding does not suit these medium sized sheep since they thrive on so little. They will definitely get too fat. However, if you are not intending to feed grain and if you don’t intend to grow your lambs beyond 100 lbs. – take it from me, you don’t have to worry about anyone getting too fat. Originally, the established buyers at auctions resisted hairsheep in general and they fetched lower prices in places like New Holland. The trend is now reversed. In California prices for hair sheep have surpassed prices for wool sheep and in New Holland they are catching up. The customers, including the many ethnic customers, caught up and appreciate the milder flavor of hairsheep. I no longer sell at livestock auctions mainly because I don’t have to. I direct sell a great number of lambs. My customers are also distributors of various sizes who sell mainly at restaurants and their private customers. As they say, the proof is in the pudding eating. If my product would be poorly finished or wouldn’t taste good, I surely would lose customers. Instead, I get raving reports back and I never seem to have enough market lambs to make everyone happy. The flavor of the market lambs is in my opinion mostly influenced by the fact that these lambs are grass-fed. My Texel and Dorset lambs that I used to have in the past didn’t differ that much in flavor, although the WD lambs are indeed milder tasting. 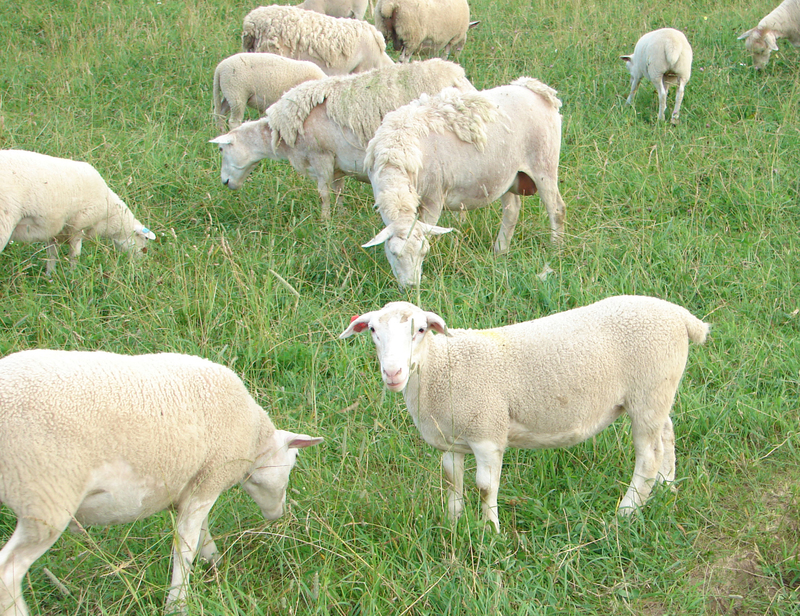 In lambs, grain feeding versus grass-fed has a greater influence on flavor than the differences in breeds. However, in older hairsheep the flavor is still impressive due to the genetic factor. I sell a lot of culled ewes as roasts, ground meat, stew meat and various sausages. The mild and yet rich flavor of these culled ewes is remarkable and does not at all remind anyone of mutton. In fact, when we have pot roast from a culled ewe I can still fool my wife into thinking we had lamb for dinner. The shedding ability of this breed varies greatly. There is the wool type and the hairtype with the hairtype being slightly less meaty but far better shedding. What is worse, however, is the fact that there are breeders who do not select for shedding ability and for the show ring instead. What is the point of getting hairsheep when you end up shearing them? If you consider hairsheep like White Dorpers in the future don’t forget to ask the breeder about the shedding ability of their flock! The first rams I purchased were of outstanding shedding ability. As a result, about 50 percent of the first generation of White Dorper cross bred sheep shed partially or mostly. The other half needed shearing. However, they all shed around the belly, legs, head, and all the other places that would otherwise prolong shearing. There was only the body fleece that needed shearing. Subsequent generations with higher percentage shed better and better although shedding is not a black and white thing. It improves from year one to year two of age but can again be reduced by external factors like disease or weight loss. And some shed one year but not totally the next for no apparent reason at all. It’s also possible that some pieces of wool or hair remain along the back or on the hind quarters or arm pits. That is normal. So, what about littering the pasture with wool? You will find the occasional larger patch of wool in your pasture and you will definitely find wool and hair on the trees where the sheep rub. But the pasture littered with wool as I had feared just did not happen. The wool and hair comes mainly off in such small pieces that it is like a cow or a goat shedding – you don’t worry about their hair littering the pasture either. As far as winter hardiness is concerned, I have my sheep out in zero degree weather. While they always have access to a wind break when the wind howls, they are not being housed with the exception of those that lamb during the winter. I can’t speak to colder temperatures, taking zero degrees without a problem is good enough for me. However, since Dorpers can also be found further North in colder climates, I am sure that a lack of winter hardiness is not a trait applying to Dorper sheep. There is no such thing as an ideal breed. You will always need to make compromises if you choose to have a purebred flock. However, if I consider the traits described in this article and add the easy lambing, good mothering and fertility as well as the calm disposition and eye appealing looks of these sheep to the mix, I have come very close to the ideal breed – at least for my farming system and my market. There are without a doubt breeds that surpass White Dorper sheep in one or the other trait. If you combine all traits I have not found a better breed for a farming system based on pasture and direct marketing. Ulf Kintzel owns and manages White Clover Sheep Farm (www.whitecloversheepfarm.com) in Rushville, NY where he breeds grass-fed White Dorper sheep. He can be reached at 585-554-3313 or by e-mail at ulf@whitecloversheepfarm.com. Copyright 2010 Ulf Kintzel. For permission to use either text or photographs please contact the author at ulf@whitecloversheepfarm.com. Hi currently running flock of 600. I have noticed that some lambs are showing caramel patches. One in particular is more like a paint horse. I can only put this down to past genetics. Question is this common? You’ll have to contact the author directly with your question. His info is provided at the end of the article. Thanks! 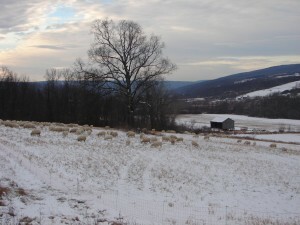 Pingback: Little Sisters Homepage - First time sheep buyers ! Pingback: Little Sisters Homepage - How do I convert my wool sheep flock to a shedding dorper flock ? How often do dorpers have breeding problems and we will then have to pull the lambs? For specific questions, please contact the author. His information is given at the conclusion of the article, pasted below. I belong to a herding club in Hawaii. We have a dispute between the members about feeding sheep after working them. Half of the group thinks it is okay to feed hot sheep, the other half disagrees. The outside temp is above 85* sheep are heaving and panting rapidly. I think that we are asking for bloat. I’ve passed your question on to the author, Ulf Kintzel. He should be able to answer your question. I have a pet ram lamb, texel dorset cross I was told. He is 8 months old. My question is, how much should he weigh. He seems pretty big to me, but since he is my first sheep, I don’t know what he should weigh. I don’t want him to get unhealthily fat. I have no way of weighing him. Thanks for your question! Please direct it to the author, Mr. Ulf Kintzel, at ulf@whitecloversheepfarm.com. I forgot to ask for notification via e-mail, so I am reposting my questions. How do you collect wool from self-shearing sheep? Do you have to go around picking it up out of the pasture? Hi Donna, thank you for your question! As we are a small office and do not have a sheep specialist on staff, I will direct you to the author of this article, Ulf Kintzel. You can contact him with your questions at 585-554-3313 or ulf@whitecloversheepfarm.com. He should be able to answer them. Thanks for your comment! Sheep will generally reach puberty between 5 and 12 months, so it is possible for her to be pregnant if she has been in contact with a ram. This website might be able to help you: http://www.sheep101.info/201/ewerepro.html. I have a very small Dorper ewe, she is 7 months old but very small. I am new to the sheep business so I am concerned that she will never be large enough to breed. My Dorper ram is not really large but he is bigger than her. If I took the chance and had her bred would she be able to carry her lamb/s? I’ve done some research on this, and it looks like in theory you can breed a Dorper ewe at 8 months if she has a good body weight, but if not it is recommended to wait until she is about 10 months old. I would suggest you wait a few months and keep observing her body weight, because it is likely that she may continue to grow. If you are still worried at that point, you may want to consult a local vet. If you’d like a second opinion, you can also contact the author of this article, Ulf Kintzel, directly at ulf@whitecloversheepfarm.com. I hope this helps! Hi Joanne. Yes, you can milk Dorper sheep! Feel free to contact the author, Ulf Kintzel, at ulf@whitecloversheepfarm.com for further information. I’d recommend getting in touch with the author of this article- he might have some good insight for you. He can be reached at 585-554-3313 or by e-mail at ulf@whitecloversheepfarm.com. Hope this helps!